First make the dressing by blending together the garlic, chilli and sugar in a food processor to make a rough paste. Then add the fish sauce and lime juice and season to taste. For the salad, fry the shallots in the oil for around 5 minutes or until crisp and golden brown. Remove with a slotted spoon and drain on kitchen paper. 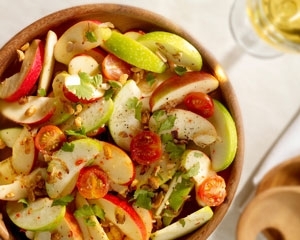 Toss the apple in the lime juice, then mix with the tomatoes and dressing. Serve topped with the peanuts, crisp shallots and coriander. Ida Red apples can be replaced by Royal Gala apples.